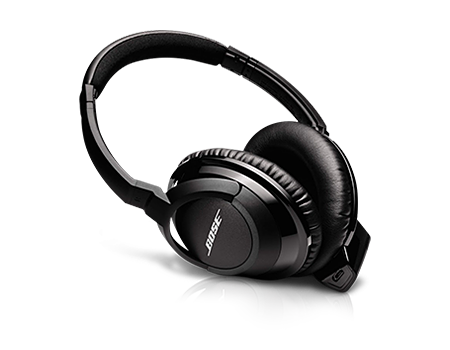 The Bose AE2w Bluetooth wireless headphones deliver full, natural sound and a comfortable, around-ear fit. Bose over-the-ear wireless headphones allow users to listen to music, movies, videos and more without the need for wires. The AE2w headphones deliver full, natural sound and a comfortable, around-ear fit thanks to cushioned ear cups. It also comes equipped with a Bluetooth® module to control certain iPad functions, Bluetooth connectivity and more. Connects up to 2 devices so users can switch between calls and media. Bose® quality sound brings your entertainment to life on your iPad, or other Bluetooth® device. Bluetooth® technology lets you enjoy wireless freedom from around-ear headphones that feel comfortable for hours. Design and placement of controls allow you to easily operate certain functions of the iPad directly from your headphones. Simultaneously connect to two Bluetooth® devices and switch between enjoying your iPad and taking an occasional call. Charges easily with included USB cable, while LED and audio indicators provide power, battery life and Bluetooth connection status. Includes carrying bag for storage when not in use; audio cable for use without battery power or Bluetooth® connectivity.